Now I’m working on a feature documentary film about the effect of urban development on low-income neighbourhoods. My idea was to do a series of interviews on the subject, focussing on areas already pegged by the city as needing to be “modernized.” Unfortunately, in Montreal that means tearing down old, potentially historic buildings, to make way for new high rises. I started with Shaughnessy Village, located in the west-end of downtown Montreal, where I spoke with Roger Peace from the Shaughnessy Village Association. They’re a group of residents working to clean-up the community, where a large group of homeless, aboriginal and drug addicts call home. Mostly around Cabot Square. A new condo development on the site of the former Seville Theatre, which was left decaying over many years and torn down a few months ago, is turning the area next to Chez Doris, a women’s shelter, into a large construction site. Questions were raised by Sylvie Cornez, the executive director at the shelter, as to whether all this money pouring into the condo development by the city will see some social housing units built. It will not. This seems to be emblematic of what’s been happening all over the city of Montreal. Urban development pushing the city’s poor and homeless people further into isolation, and further into its extremities. 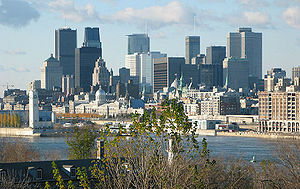 The second community I analyzed was Parc-Extension, one of Montreal’s most culturally diverse communities. Parc Ex has been long known as an immigrant community. Their prime real estate, a piece of land along the railway, borders the extremely wealthy suburbs of Outremont and TMR (Town of Mont Royal). Members of Parc Ex have formed a citizens committee to educate others about the effects of gentrification on low-income communities, like their own. In this case, I spoke with Guiliana Fumagalli, a mother and activist leading the opposition to large-scale development and a new campus being built there by the University of Montreal. On the other end of the spectrum, I interviewed the woman known as the “Mayor of Parc Ex,” Montreal city councillor Mary Deros, who shared her support for the this project. I will be turning these interviews into a feature film, which I hope to receive funding for at the end of summer. I will keep everyone posted as to the success of this project. As for now, I will be filming my eighth interview for this documentary tomorrow. If you want to check it out, I’ve posted them online one-by-one, calling it: The Gentrification Project.